According to reports there is a new dual-screen Surface device in the works at Microsoft, this isn't the mobile 'Surface Phone' type device but something more notebook sized. Windows Central's sources indicate that the new member of the Surface range is in some ways similar to Intel's Tiger Rapids prototype (seen at Computex this summer, pictured below as a reminder), and in some ways akin to Microsoft's Courier project. This new Surface form factor has a working project name of Centaurus and is currently a higher priority for Microsoft than the pocketable Surface mobile device codenamed Andromeda. Sources speaking to Windows Central indicate that Centaurus will be Microsoft's first dual-screen 2-in-1. The two screens can work in tandem in productivity, input, and other tasks. Microsoft is probably looking at various saleable use cases not too far away from how mobile makers are looking for USPs related to the operation of the nascent foldable screen form factors. With Intel as a key hardware partner, Microsoft will be building its first Centaurus devices on the x86 platform. However, reports suggest that it may be one of the first devices to come with a restricted version of Windows 10 called Windows Core OS. Designed from the ground-up for dual-screen devices, this OS will only run apps from the Microsoft Store. "Microsoft has been focused on getting as many Win32 programs into the Microsoft Store as possible during the last couple of years," says Windows Central, so that should go some way to softening the impact of that restriction. If you are interested in further emerging details about Windows Core OS, I recommend the recent article about it by MJ Foley on ZDNet. Those wishing to see more of the hardware will have to wait until next year, possibly as late as autumn. That gives the project developers quite some time to refine the Centaurus proposition. 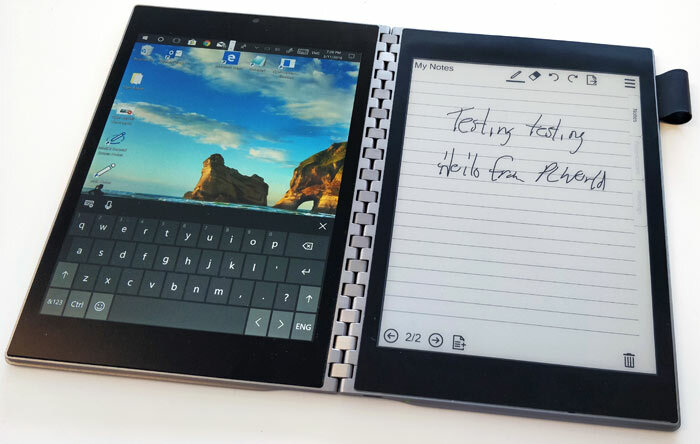 Perhaps Microsoft will use the time to absorb some inspiration from the multiple foldable phone devices we expect to see early next year too. Acer launches Helios 700 gaming laptop with sliding keyboard MSI GL63 laptop with GeForce GTX 1650: promo slides shared PC Specialist Vortex S1 Microsoft intros slimmer and lighter modular Surface Hub 2S Has Samsung been chosen for Intel Xe GPU manufacturing? Windows Core OS = Windows RT mk2? As long as we can still install stuff from external sources by ticking a box then I have no issues with the store being on windows 10. If I can't do this and the store is the ONLY option to get programs then the device, even though it's something I like the sound of, would be an instant no buy. I draw a line when I'm basically being forced into rebuying stuff even though though my existing programs still work fine. I don't see a reason to get the latest version of office for example when office 2010 still does the job just fine. It also prevents me from installing all my little QOL apps let alone any ‘professional programs’ (adobe CS, autodesk for example) which are not in the store. As soon as they prevent loading of apps I am sure someone will have solution to work around the restriction. Although I am tempted to move lock stock over to a linux distro, not even Apple are stupid enough to lock out the loading of traditionally distributed applications. Stop trying to make Windows Store happen, build something worth while and people will use it. Microsoft seem to be making strides towards being a more closed system similar to Apple's OS's. You would think that after their failures with Windows RT and not supporting and developing Windows Phone (which was decent) they might have thought of actually developing something consumers want. Looks like the Lenovo Yogabook from a couple of years back!